MHS sophomore Breanna Zirkle (9) sets to deliver a pitch during the Lady Marauders 5-4 victory over Vinton County on Friday in Rocksprings, Ohio. ROCKSPRINGS, Ohio — Saving the best for last. 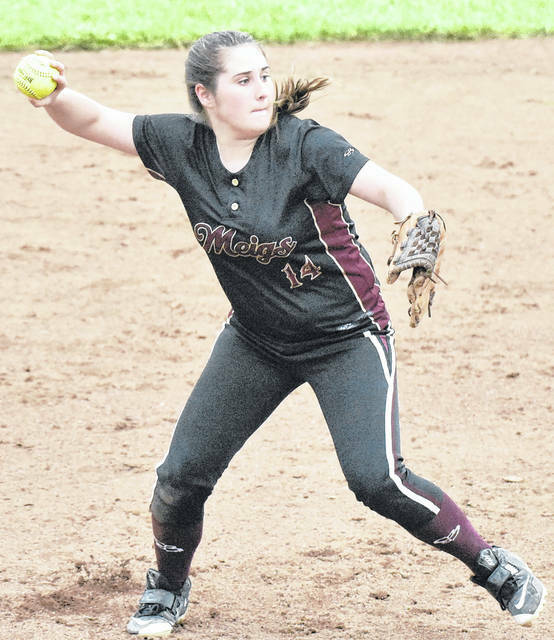 The Lady Marauders softball team carried a 2-0 lead into the top of the seventh inning, but the visiting Lady Vikings rallied to take a 4-2 advantage — setting the stage for the Maroon and Gold to earn a dramatic 5-4 walk-off victory on Friday night in a Tri-Valley Conference Ohio Division contest in Meigs County. Meigs (3-1, 1-0 TVC Ohio) jumped out to a 1-0 lead in the bottom of the first frame as Taylor Swartz led off with a double and later scored on a sacrifice by Breanna Zirkle. MHS tacked on another run in the bottom of the third inning, when Chonslyn Spaun started things off with a single and scored on a hit by Alyssa Smith to propel the hosts to a 2-0 advantage. 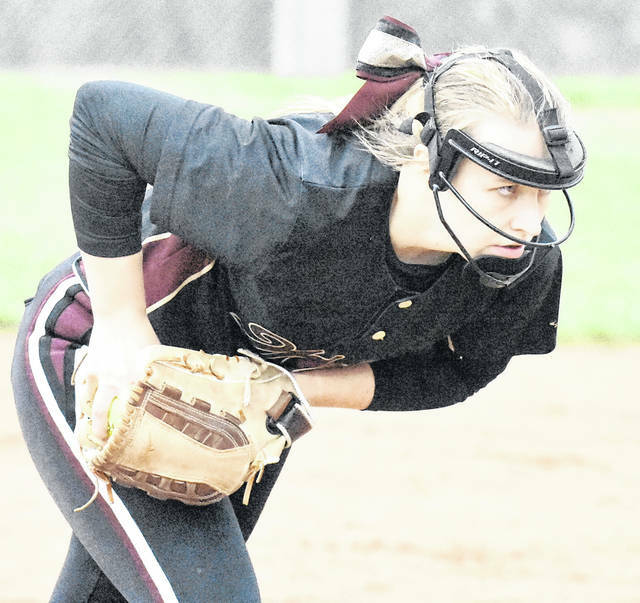 Vinton County (3-4, 0-2) remained without a run until the top of the seventh, but Josie Humbree led off with a single and Brookesanne Barnett followed by reaching on an error at second to spark a late rally for the visitors. Trouble ensued from there for the hosts, as Darian Radabaugh, Kelsey Ward and Abby Faught each reached base and scored when a Lacy Stapleton triple pushed the Lady Vikings ahead by a score of 4-2. Meigs countered in the bottom of the seventh frame, as Hannah Tackett led off with a double and Swartz followed with a single. With two outs in the inning, Peyton Rowe stepped to the plate and lined a triple to knot the game at 4-all. Spaun concluded the comeback in the next at bat with a single to drive home Rowe to clinch a one-run victory for the Maroon and Gold. Zirkle earned the complete game victory for the hosts, as she collected nine strikeouts in seven innings of work. Faught was pinned with the loss for the Lady Vikings as she surrendered five runs, 10 hits, with five strikeouts in seven innings in the the pitching circle. Spaun led the way for the Lady Marauders at the plate with three safeties, while Swartz was next with two hits. Zirkle, Rowe, Tackett, Alyssa Smith and Jerrica Smith each finished with one safety apiece. MHS head coach Bryan Swann was pleased with the win — but also focused on how his team found itself in need of a late rally and the lesson in it for his players. “We wouldn’t have been in that situation if we were a little tighter on defense,” said Swann. “Frankly, we struggled getting onto their pitcher. We made a few adjustments and that paid off. We stepped up under pressure and hit the ball well. What we can take away from this is that we would have never been in this situation if we would’ve taken care of things defensively.